1.Do you have own factory? Where? KL is joint enterprise ,with branches in Haijing and Foshan city . 2. How big is your factory? How many sq.m. always have in your warehouse? What about raw materials? Our Foam board factory carries area about 20,000sqm production plant , we maintain regular stock no less than 1500,000pcs foam board and 3000,000sqm pvc foam board in warehouse. We are equipped with 2 polystyrene extruding lines, 4 foaming and heat lamination lines, 1cold paper lamination line , 1self adhesive process line, and 2 pvc production lines ,which enable us to provide prompt delivery. 3.Where do you selling the most? For the last 10 years ,we sold our foam board products to Australia ,USA,Greece ,Spain,France(35% of exporting capacity),and middle east (25% of exporting)such as Kuwait ,Dubai,Jordan, South-Eastern Asia countries (15% of exporting capacity)such as Singapore,Malaysia ,Indonesia,Taiwan,and More regions. 4.What material liners do you use for the coating on 1 side of 2 sides of foam board �C Paper gram ranging from 120, 150 or 210 gsm? Talking about foam board,it is also known as paper-faced foam board ,paper foam board ,paper kt board ,foam board with paper liners. C:210 gram white clay coated card paper which is replaced by 157 gram paper gradually because 157gram paper features snow white . However ,Our foam board is also available with HIPS film liners ,PP film liners which is entirely plastic coating . The reason why we launching HIPS film liners and PP films is to satisfy the demand of mounting photo artworks and costing -saving . All of our foam board is available in non adhesive and adhesive ,high tack and low tack for selection . 5.What about quality of export packaging? Is it water resistance package? We pack with 5 layers corrugated carton outside,inner with poly bag wrapping for resisting moisture. 6.Quality control of foam core? Thickness differences? Measure of sizes. We carry rigorous quality control for exporting foam boards . We provide 100% money back factory warranty for all our foam boards!!!! 7.Can you do other colors of foam core, except black color? A:We are able to produce color natural foam ,which is without any coating ,7 colors available ,please refer to our catalog . 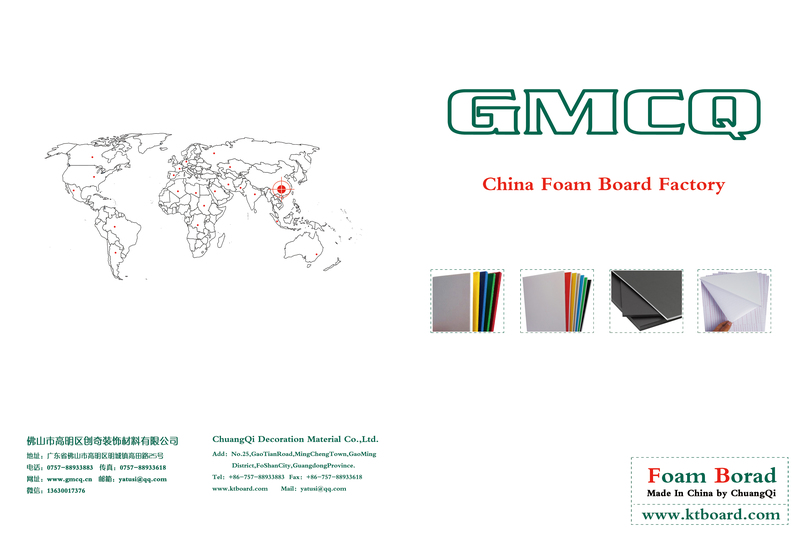 B: We also make color paper-faced foam board ,with more than 12 colors available ,please refer to our catalog . 8.Do you have toxicity test? Foam board is made of Polystyrene foam board which is eco-friendly material ,it is totally can be recycled ,that is why we can export to European market where there is strict policy on plastic . 9. Can you produce foam core with 15 mm and 20 mm thickness? We also can produce 1525mm 1300mm width foam board.